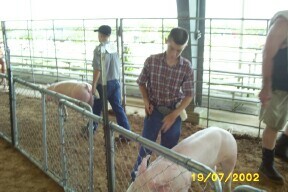 Welcome to the 4-H photo album! Welcome to the Iowa Colony 4-H Photo Album! Get us your photographs so we can add them to this page! you can do is wait till your class is called. Cody is your pig causing a traffic jam? Cody looks like a pro and this is just his 2nd year! 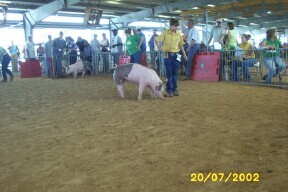 Swine Show of this 2002 4-H Year. minute instructions before the show!